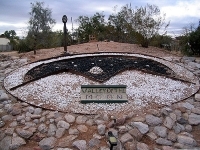 The Valley of the Moon was designed to stimulate the imagination of children and to awaken creativity and spirituality in all visitors. Delve into a fantasy land in the desert, with historic Western sites in a magical setting, created by George Phar Legler in the 1920s. Mineralised rock cliffs, caves, pools and garden miniatures have merged with tropic and desert flora to make what Mr Legler called the 'Fantasy Touch of Three', referring to the worlds of Edgar Allen Poe, Lewis Carroll, and Robert Louis Stevenson. There are tours, shows and a gift shop on site. The Valley of the Moon also hosts events ranging from weddings to concerts and yoga retreats. Although this unusual attraction may not be to everybody's taste, those travelling with children will no doubt find a visit rewarding.